The 34th Annual Natural Hazards Research and Applications Workshop, managed and hosted by the Natural Hazards Center of the University of Colorado at Boulder, took place July 15-18 at the Omni Interlocken Resort, Broomfield, Colorado. The workshop is designed to enhance the transfer of knowledge and experience among participants representing a broad range of disciplines and sectors of the hazards and disaters community. The workshop provides a forum for vigorous debate on critical issues, by emphasing questions and answers during a program on concurrent sessions. Participants to the wokshop are invited because they all have important information, and knowledge to share. 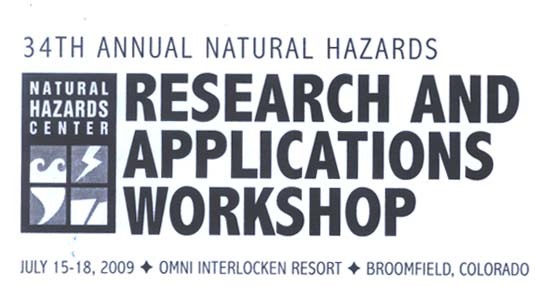 Ricardo Alvarez was invited to participate in the 2009 Annual Hazards Workshop as a panelists on two different concurrent sessions. The first one on Thursday, July 16, 2010 from 3:30 to 5:00 p.m. titled Climate Change Mitigation, Adaptation, or Preparedness? addressed how different sectors use language that may have the same or similar meaning, but is based on terminology that differs from one sector to another. For example: the climate change sector talks about adaptation to climate change to signify concern about reducing damage that may be caused by climate change. In disaster risk-reduction terms the same concerns are addressed through mitigation measures that are effective ion reducing the potential for damage from the impact of natural hazards. But the emergency management and humanitarian assistance sector expresses similar concerns through preparedness initiatives. The panel and session participants discussed if these differences in semantics might impede effective communication across sectors or lead to different actions and priorities. Ricardo was also a panelist at a second session, on Friday, 17 July from 4:00 to 5:30 p.m. titled Are we Ready for a Hurricane Impact Index?. The panel discussed how the Saffir-Simpson hurricane intensity scale, which has been used for more thn 30 years, has limitations that may have led to some confusion among the general public and other sectors. The discussion focused on examples of actual hurricane events where the intensity category and the actual impacts and damage appeared to be in discrepancy. One argument by Ricardo Alvarez was that personal experience often colors the perception and individual may have about what the category assigned to an approaching hurricane really means, he also argued that comments and opinions by media reporters ahead of an approaching hurricane may also be contributors to some of the confusion mentioned before.